Yesterday, I came across an insightful post from Jeremiah Owyang. If you know who he is, you won’t be surprised that it’s insightful. Jeremiah is regarded by many as the leading analyst (globally) in online marketing and communications. He’s an industry analyst at Altimeter Group, and was previously at Forrester Research as a Senior Analyst focused on Social Computing for the Interactive Marketer. His blog focuses on how companies connect with their customers using web technologies. He’s very well published, regularly speaks at key events, and absolutely knows his stuff! In his post, he reviews a report just published by a colleague. He notes that “this report had a thorough methodology that interviewed over 50 brands, agencies, vendors, and industry experts to find out how the industry is changing.” He’s referring to the online marketing industry. Visual information reigns supreme, from engaging video to images to infographics. Budgets must increase to accommodate content channels such as engaging video and mobile that require larger production and development investment. 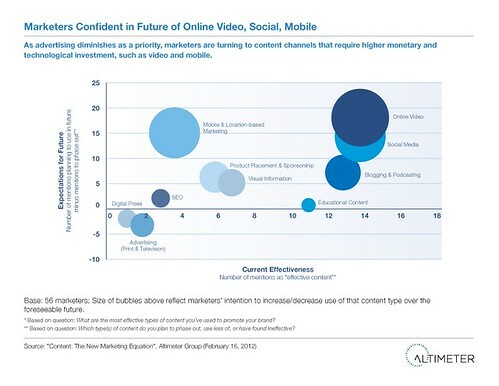 This provides very strong evidence that marketers are focussing on video over any other marketing activity, as can be seen from this graphic. This matches perfectly with what we are seeing across multiple industries in 2012. Interesting also is that this study reinforces that marketers are seriously reducing their spend on traditional PR, broadcast advertising and print. Given that these areas of marketing are providing seriously diminished ROI, no surprises there. If you want to read the entire report for yourself, Altimeter Group have kindly allowed full sharing (eat your heart out, Forrester!). I guess they “get it” when it comes to the online world! Report below.